We Chinese Fancy "Hot Pot", which is a famous representative of Chinese food and eating culture. Wherever you find Chinese people, you'll find them enjoying "hot pot." It is popular everywhere in the Chinese world, from Beijing to Canton and from Western China to Taiwan. It can also found in overseas Chinese communities all over the world. Hot pot has been popular in Korea and Japan, as well. Hot pot is kind of simple enough to prepare, you just need a big boiler and soup, the key is to prepare all the vegetables and meat ready and clean for the hot pot. Nowadays, people often use induction cooker, which is very convienient to use and quite fit the hot pot style of eating. The basic soup in the hot pot had better to be bone soup or chicken soup to make it most nutrient and tasty, or you can just put ordinary water and then add some hot pot sause, which has lots of options in the supermarkets. 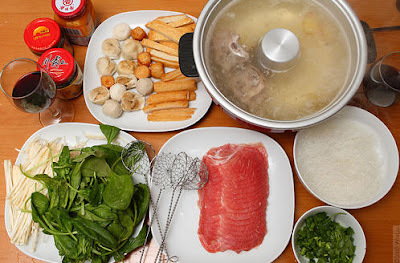 Almost any kind of food can be used to make hot pot--all kinds meats and vegetables are used. Also, tofu and noodles and other special foods can be added. The soup may become even delicious after all the different stuff has been put into it. I like tofu and bamboo shoot the best, and as to meat, I prefer mutton slice meat. Eating hot pot is not just about the kind of food or a method of cooking. Eating hot pot is an expericence to be favored. It is best enjoyed as a social event, in the company of friends and family. Eating hot pot together builds friendships as people share the cooking and eating of the food. In other words, good company is another of the " ingredients" in hot pot.